In the hustle and bustle that defines an urban setting like New York City, you can’t help but notice the bright lights and flashing messages. But, for Wells Fargo, going digital wasn't just about being noticed. It was the key to their East Coast success. In 2008, Wells Fargo bought the failing Wachovia Corp. in an east-meets-west venture, bringing the Wells Fargo store number to more than 6,000 nationwide. With the acquisition came the opportunity to introduce the iconic red, stagecoach-clad Wells Fargo brand to customers in the east who were used to Wachovia’s signature green and blue. In New York City, Carey and his team worked with a group called Bluewater Technologies to implement a digital signage program. Bluewater installed 46- to 60-inch Samsung and Sharp monitors in new Wells Fargo locations, while the Gilmore Group created messaging geared toward educating both customers and the world outside about the brand. “Wells Fargo really made the big investment in monitors that were high quality and large enough so people walking along the street could see the messages we produced,” Carey said. When the team was developing the program, they looked at what other retailers were doing and incorporated that knowledge. “In New York City, Wells Fargo was a completely unknown brand, and I feel that we’ve accomplished the objective of becoming recognizable with digital signage,” Carey said. Behind the tellers inside the New York City branches are one-by-two displays running customer-specific messaging, but two-by-two display monitors expose those passing by to a different kind of digital messaging. The project certainly wasn't Wells Fargo's first foray into the world of digital signage— but it would prove to set the tone for their future relationship with the technology. Carey started his career with Wachovia in 2002 as a copywriter, but he saw his opportunity for advancement in relationship management. That led him to a position in print merchandising. “Looking back, I had no idea what I was getting myself into, but it was great exposure and my creative background, along with my ability to see what needed to be done in the retail environment, helped,” he said. Wachovia had installed digital signage that helped to reduce customers' perceived wait time. The displays ran content from the Bloomberg network, and Wachovia was able to insert their own messaging during commercial breaks. However, Carey said the program was expensive and didn’t resonate well with customers. “To help reduce costs, we started producing all of our own content in-house; this cut the cost in half,” he said. The company did a lot of research, talked with vendors and proposed a pilot digital signage program. Around the same time, Wells Fargo also was considering a pilot program in their stores, so when the two companies fell under one roof, they grew the program together. “There was a lot of synchronicity, and both companies were thinking along the same lines,” Carey said. This was a good development for Wells Fargo. Wells Fargo already provides region-specific marketing to large markets such as Miami; Washington, D.C.; Charlotte, N.C.; and New York City, plus 10 stores in Minnesota and many more locations. But the next step in their digital signage journey is providing more stores with localization capabilities. “The imagery that’s on the screen in Duluth will be different than in New York City, so we’re trying to capture those differences and make them work for us,” Carey said. A recent example of region-specific marketing that impacted Wells Fargo customers was the aftermath of Hurricane Sandy. New York City Wells Fargo stores were able to localize their messages to thank customers for their support of the relief efforts through their digital signage. In Minnesota, stores are able to create their own messaging, including live rate fees for CDs, auto and home equity rates, which lends well to the Wells Fargo idea of being regionally driven. “So far, testing this kind of messaging in the area is going really well,” Carey said. Another real-world example of the power of digital signage came while Carey was on vacation in Florida over the Fourth of July. He needed a check deposited and usually took care of it by using the ATM, but instead he decided to explore the region’s Wells Fargo stores. As he stood in line, Carey watched as the customer in front of him glanced at the screen that gave informa- tion about stamps available for purchase in the ATM. As the customer took care of business with the teller, Carey overheard the customer ask the teller about stamps. Carey’s continued role allows him to wear many different hats—working with the advertis- ing team, handling signage in any of the stores nationwide, working with digital and print options, targeting messaging, and leading a team comprised of a creative group, video network specialists and a marketing team. He also leads the way in brainstorming evergreen topics for the digital messaging program—top- ics such as debit cards, checking accounts, building a savings and many more that can be used across the Wells Fargo network. “When you go into a Wells Fargo store, the television monitors should be on our channel, and we produce 100 per- cent of that content,” Carey said. He is responsible for developing content, including period messaging: messages that are changed quarterly depending on the goals of the company. At present, Wells Fargo has a Hispanic channel in about 650 stores and targeted messaging in nearly 60 stores. They’re constantly looking for ways to make this system more accessible to regional partners and scale out the IP delivery. “Our challenge now is, how do we localize the messaging for nearly 6,000 stores nationwide?” Carey said. 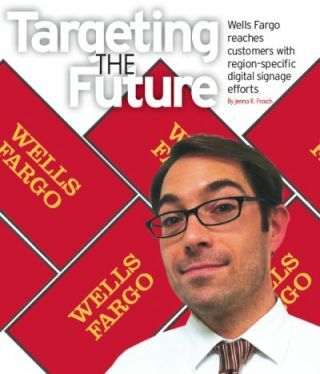 He’s looking toward what’s next for the digital signage program—how to provide all of the Wells Fargo stores with the ability to create, distribute, manage and afford localized imagery and local news for every market. Carey is leading that effort. The team has built templates that allow regions to create their own messages within certain guidelines that are brand approved. “We’re trying to simplify and expand our targeting capabilities,” Carey said. Emerging technology plays a major role in Wells Fargo’s future digital messaging, and now, the company uses smaller media players that are more powerful than those that were introduced in their New York City program. This allows the player to be mounted at the monitor instead of in a back-of-house rack. Carey said this makes installation and maintenance much easier, and the cost is significantly less. Carey’s team also looks to answer some key questions: How can we leverage the system we’re building and scale that out to benefit the company and the customer? How can we be more environmentally friendly? How can we look to more mobile and digital signage? Carey and his team are looking into opportunities such as geocaching, mobile device interaction, QR codes and other ways to add in flexibility for digital messaging.